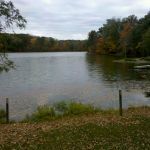 Ask fellow campers about "A W Marion State Park" and nearby attractions. Small outdated park. You have to drive through a rural residential area to get here. Sites are narrow and short, and few are anything close to level. We stayed in site 56, had to back the motorhome up to the block and the jacks are over the edge of pad. Probably 2-1/2 -3' off ground. Very quiet with mostly just woods noise, quite relaxing. 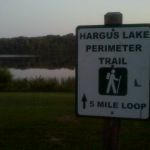 Trails around the lake and a marina. I was told the small mouth fishing is good. 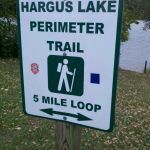 If you decide to come, make sure you set your coordinates for the campground because it is across the lake from the marina and to get there you have to drive 5.5 miles around the lake if you go there first. Camp host was less than friendly. We waved, he ignored. :/ Camp store wasn't open when we arrived Sunday 3pm. Receptacles are all old and crusty looking but the power was steady and reliable. They didn't tag our site as reserved but had tags for the weekends already on the post. The road leading into the campground needs some serious pot hole filling. Speed limit says 20 if you go over 5 you will be sorry. Having said all that, it is still a nice quiet campground to get away too. On Sunday there were only 5 campers here. Nothing really nearby to see. A couple other state parks within 40 miles. Convenient to launch a kayak or canoe, there is a road in the campground that leads down to the lake. Questionable launching though, lots of mud. There is a nice restroom on the road coming in and they have portajohns around the campground. Small playground for kids. There is a dump station and a couple different places to get water. We camped at A W Marion State Park in a Motorhome. The camper pads are too narrow with drop offs that can cause you to twist your ankles....this is like most State parks....uneven and too short pads which you don't know about until you are there. The park has no shower facility which is hard on anyone trying to tent camp. The camp store was open till evening when we stayed and the store employee walked the campground once a day. The camp host greeted us and informed us that there was a cat fish tournament and bean soup for lunch which was the first of many times we have camped there. All the sites are very muddy when it rains so plan on bringing boots.... There is no one to enforce quiet hours. The setting is a older campground and if you just want a relaxing stay then this would be suitable. We camped at A W Marion State Park in a Travel Trailer. We self registered and never saw an attendant. The camp store was never opened or staffed. It was unkempt. I don't mind the wildness but the lack of store was inconvenient. The pads are extremely narrow so you have to step out into the mud. We camped at A W Marion State Park in a Motorhome. We stayed on the July 4th holiday. It was not filled. Many people in Ohio do not know that this park is here. It is really small and older. 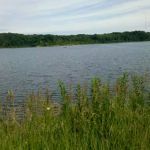 There is a small lake with swimming area and a marina with boat rentals. The trails that we were on were nice. Over all a very quiet small park. There was weekend outdoor movies. Nice playground. We were here without children. I will stay here again. We camped at A W Marion State Park in a Motorhome. This is an older ohio state park that still has the latrine toilets and no shower house. Keep that in mind. Some of the sites could hold our 37 ft 5th wheel, but you could tell the roads (and trees) were put there with smaller units in mind. The sites were mostly shaded sites with little or no grass, it rained (and hailed) right after we arrived and the area was completely muddy. Most of the sites were at that upward or downward slant of yesteryear and some of the sites could stand re-paving. The sites are very close together so keep that in mind if you like privacy; considering it was packed over the weekend. All that said, if you like to fish, and can go during the week when it is not crowded and rain filled, it could be a nice little hideaway. It is right beside a nice little lake. Go not expecting a lot and you will not be disappointed. We would go back if in the area or wanted a last minute getaway as its only 45 minutes from us. The campground is about 15 miles west of Lancaster on US 22 almost to Circleville. We camped at A W Marion State Park in a Fifth Wheel. Are you affiliated with A W Marion State Park ?